The success of the Yo-Zuri Pin's Minnow on a variety of fish is no secret. Every avid angler has AT LEAST one in their tackle box. 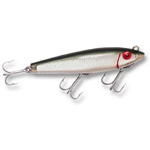 Yo-Zuri now introduces the next step in the Pin's Minnow lures with the introduction of the Pin's Magnet. Yo-Zuri has added our Patented Magnetic Weight Transfer System into the body of the Pin's Magnet. With more anglers fishing in public places the advantage of further casting distance can be the difference between catching and fishing. In addition, finishes on the Pins Magnet series are even more detailed with brighter holographics and extra flash. Reach the fish that you've been missing with the Pin's Magnet. � Detailed etched finish complete with gill plates. � Weight Transfer System��internal steel balls assure long casts, balanced action ( 2-3/4" sizes only ). � Extremely sharp, strong VMC� Cone Cut� treble hooks for fast penetration. � Stainless steel split rings. � Weight - 3/16 oz.